Generosity, love, warm hearts, thinking of others, giving back…these are the true shining gifts of the Christmas season. Recently, a Budd Lake Sixth Grader, reminded everyone of that. This past December, Mt. Olive Middle School Student, Rylan Lessing demonstrated the true meaning of holiday spirit when he spent his own money–$50 in savings- not on anything for himself– but for toys for the patients of Goryeb Children’s Hospital in Morristown. Goryeb is a state-designed children’s hospital for the treatment of pediatric cancer. In his desire to give back, Lessing went the extra mile when he organized a toy drive held from December 17th to the 22nd. All to help these critically ill kids have a Merry Christmas. Everyone was so impressed with his altruism, that that it quickly became contagious and inspired others to give as well: from parents, to friends, to community, to Mt. Olive Middle School, and even the mayor. Once social media heard of the 11 year old’s idea, it exploded. 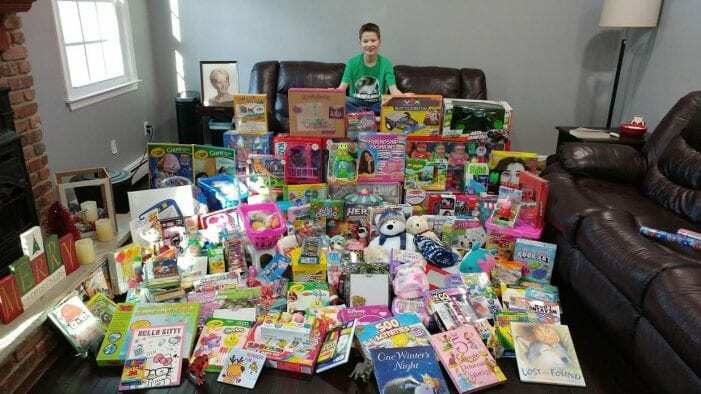 When all was said and done, Lessing’s original $50 and simple idea to get a few gifts for children battling cancer transformed into almost $500 in cash, and approximately $1,000 worth of donated goods! Why Goreyb Children’s Hospital? Lessing himself is quick to answer. Goryeb was both extremely excited about the toy drive, and amazed that someone Lessing’s age wanted to do something like that. 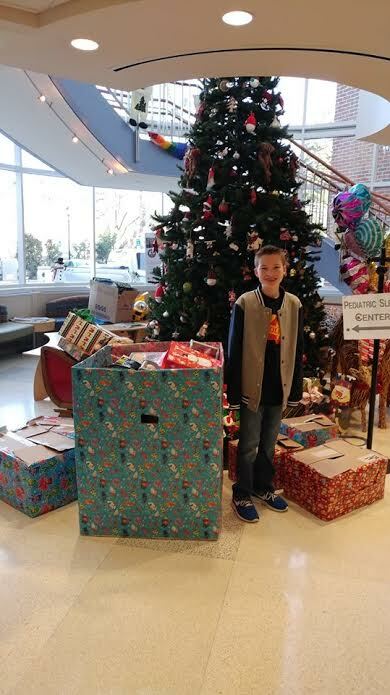 Lessing’s parents quickly gave their blessing and matched his donation (as did his nine year old sister Mackenzie, who also shopped for the drive), and offered to drive him to the hospital to drop off the presents. But the generosity did not stop there: When Lessing had told his teacher his idea, she was touched. “I told him I’d help in any way I could,” Mount Olive Language Arts Teacher, Jessica Wood, prides. She also set up a donation box in the school so that others could donate. Right from the beginning, it was obvious to Wood that the toy drive was close to Lessing’s heart. “During his lunch period that very day, Rylan made a flyer advertising the toy drive to hang in my classroom,” she relates. Toys, dolls, games, action figures and books for all ages were enthusiastically donated from so many. Wood mentions how they even received more donations once Lessing composed an email to the entire Mt. Olive School staff. Due to protocol, Lessing didn’t get the opportunity to meet the patients of Goryeb or pass out the presents personally. Instead, when delivered the presents he set them up festively under a big tree they had up across from the desk at the entrance. “I didn’t get to see any of the patients smile, but I know they did,” he shares.